For Terence McKenna’s birthday this past year (Nov. 16, 2017), the Terence McKenna Archives held a raffle for a set of photos of Terence. The first-prize winner, Graham St. John, won the full set of photos, and runner-up Jeff Lerue won a single photo of his choice. Everyone else who participated received an email thanking them for their contributions, which included a unique document compiled by the archivist with details about the locations of copies of a rare art book which Terence collaborated on. I had also promised that I would make a blog post detailing which items I was able to add to the collection with the profits from the raffle. This is that blog post. Thanks, again, to everyone who contributed! You’ll be glad to know that we were able to make bargains with some of the sellers, which allowed us to save $70 on the total cost of the items. Towards 2012 was a magazine produced in the late 1990s that was partly inspired by the work of Terence McKenna. From 1995 to 1998, the series editor, Gyrus, created five well-produced, and now very difficult to find, issues (the final two issues were housed in a single magazine, making four volumes in all). Within the volumes there are several articles which refer to, comment on, or reconsider Terence’s ideas, a transcribed version of Terence’s Tryptamine Hallucinogens & Consciousness talk (his first-ever talk at the Esalen Institute), an interview with Sasha & Ann Shulgin where some differences with Terence come up, some interesting Terence-related art (I particularly like the ‘stoned ape’), and several ads for Terence-related material, including his website. Of particular note for the archive is an advertisement for a “hefty zine” called Heads and Tales, which lists “Terence McKenna” under the contents for Issue #1. If anyone reading this has any further information about this zine or if you have a copy that you would like to scan, send, or sell, please contact terencemckennaarchives@gmail.com. This is a publication that is not represented in our physical or digital archives. This is a finite project, created to take a close look at the transmutational possibilities that lay before homo sapiens as we approach the millennium… At the heart of the project is the intuition that the human race is fast approaching a catastrophe cusp point – a phase transition period… 2012 CE is a date that may as well have been singled out arbitrarily for the title of this journal. As it happens, it is the date that ethnopharmacologist Terence McKenna points to as the precise location of the ‘catastrophe cusp’ in the temporal dimension; it is the date beyond which futurologist Robert Anton Wilson has stated that he is unable to project possible futures; and it is the end of a Great Cycle of the ancient Mayan calendar system. We are facing the end of the world as we know it, because it has outlived its viability. 2. 5 issues of ‘TRP: The Resonance Project’ and 1 issue of TRIP magazines (edited by James Kent–it can’t be said that the editorial staff didn’t have a sense of humor), including relevant interviews with Terence McKenna, Dennis McKenna, Rick Strassman, and D.M. Turner, articles mentioning TM, reviews of books that have contributions by TM, and more. This is a volume that has long been on the list of items to acquire for the archive but has usually been unavailable. Fortunately, a reasonably-priced copy became available at the same time as the raffle. I knew that there was both an interview with Terence and a review of his Timewave Zero software, both of which made it a high-priority item. So, it was a pleasant surprise to also find references to Terence in two other places in the magazine: in Thomas Lyttle‘s interview with Peter Stafford and in D’Artemis Hart(wo)mann’s article reflecting on the role of prostitutes in religious history. There was also an unexpected review of the Experiment at Petaluma video project produced by Terence’s friends at Rose X Media and an ad (one I’ve never seen before) for a company, Fringeware, selling Terence’s Timewave software. This is another item that has been on the acquisitions list for some time. It is an issue of High Times magazine from July 2001 containing a letter from Dennis McKenna offering some words on Terence’s passing and making readers aware of the Journey Through the Spheres tribute album produced by The Novelty Project. This issue of the Utne Reader from 1992 contains an excerpt from Terence’s book Food of the Gods, which had just been published by Bantam. The excerpt in the magazine appears under the heading ‘Just Say Yes: Rethinking our Relationship to Psychoactive Plants’. The time has come to rethink our fascination with the use of psychoactive drugs and physioactive plants… [W]e cannot simply advocate “Just say no” any more than we can advocate “Try it, you’ll like it.” Nor can we support a view that wishes to divide society into users and non-users… The suppression of the natural human fascination with altered states of consciousness and the present perilous situation of all life are intimately and causally connected… As a consequence, the maladaptive social styles that encourage overpopulation, resource mismanagement, and environmental toxification develop and maintain themselves… We pursue a business-as-usual attitude in a surreal atmosphere of mounting crises and irreconcilable contradictions… The government not only restricts research on psychedelics that could conceivably yield valuable psychological and medical insights, it presumes to prevent religious and spiritual use of them as well… [E]ncounters with psychedelic plants throw into question the entire worldview of Western culture… We are killing the planet in order to keep intact wrongheaded assumptions. Terence’s hit song with the British band the Shamen is remixed here by the geniuses of psychedelic electronica, Future Sound of London. Listen here. This book contains Spanish-language interviews with an exciting swath of the psychedelic community, including a 20-page interview with Terence McKenna. Anyone who wants to volunteer to translate this interview into English, please contact terencemckennaarchives@gmail.com. In his analysis of the phenomenon of synesthesia, Kevin Tyler Dann, touches down on Terence’s ideas at several points. George Feuerstein is notably disdainful of Terence and the ‘chemical path to ecstasy’. Jesso’s autiobiographical account includes his encounters with the ideas of Terence McKenna. Ralph Metzner’s sourcebook on psilocybin mushrooms includes several passing references to Terence, mostly showing his major linguistic influence on how people interpret their psychedelic experiences. An edition of this book that I’ve hoped to add to the archive for some time but has simply not taken priority up until now over other, harder-to-come-by, items. A very welcome addition, though. Eventually, we’d like to have copies of all editions (and translations) of Terence’s books represented. Peter Stafford’s book mentions and quotes Terence throughout, including a couple of brief comments by Susan Blackmore in her Afterword. This one I actually just randomly found at a thrift shop and thought I’d include it here. The Timewave is invoked here (via Robert Bast) among a string of expectations for 2012. At some point, I have plans to make a whole extended blog post about the occurrence of Terence’s name and ideas in the rise of 2012 literature after his death. You’ll notice quite a few ‘2012’ books in the physical holdings of the TM Archives. ….a few mentions of Terence here, too. Today’s random item from the archives comes from an issue of the magazine (no longer in production) Psychedelic Island Views, which was edited by “long-time and notorious member of the psychedelic community,” Bruce Eisner. The issue itself has a bit of an identity crisis: the cover lists it as “Volume 3, Issue 1,” while the footer at the bottom of each page inside the magazine says “Volume 2, Issue 2.” To compound the schizophrenia even further, in Eisner’s own dedication to the volume (and to Terence), he refers to it as “this second issue of Psychedelic Island Views.” How a “second issue” could be either “Volume 3, Issue 1” or “Volume 2, Issue2” is still a bit beyond me. The relevant part of this multitudinous magazine that I am sharing with you today is Eisner’s Dedication to Terence McKenna, which opens this 1997 issue…..whichever issue it happens to be. There is actually a lot in this dense ode, including some interesting data points for those who are paying particularly close attention to Terence’s timeline. As an example, Eisner mentions having met Terence in July, 1982 at a party that was affiliated with the Colloquium II: The Future of Consciousness conference. He doesn’t make clear whether or not Terence was a speaker at the conference or not, but if he was, this would have been one of his very earliest public talks. If Terence didn’t talk at the conference, it’s still an important meeting point between him and other major figures in the psychedelic community. If anyone attended this conference and has photos, recordings, or memories of the event, please do contact me and let me know what you recall. This second issue of Psychedelic Island Views carries on our tradition of honoring individuals who have contributed to psychedelic cultural experiment, proposed first by Aldous Huxley. We dedicate this issue to Terence McKenna, the bard and philosopher who has during the past decade been responsible for a resurgence of interest in the psychedelics and the experiences they engender by men and women around the globe. I first met Terence McKenna during a party surrounding a conference, Colloquium II: The Future of Consciousness, in July 1982 at U.C. Santa Cruz. The conference featured a wide assortment of speakers including Stanislav Grof, Stanley Krippner, Timothy Leary, Frank Baron, Ralph Metzner, Elizabeth Rauscher and many others. The event was a follow-up, 3 years after we had presented Albert Hofmann in the same venue at a mega-meeting called LSD–A Generation Later, the first and only psychedelic conference of the ‘Seventies. I had read Invisible Landscape in its hardbound form and was fascinated by Terence and his brother Dennis’ account of their Ayahuasca experience in the South American jungle, which Terence later exfoliated in his first spoken book and later written book, True Hallucinations. When I met Terence, he was a quiet figure in the background, doing a kind of Carlos Castaneda and quietly publishing books about the psychedelics that he held sacred. A second book authored by his brother and Terence under the pseudonym Oss and Oeric called the Psilocybin Mushroom Grower’s Guide had done a great deal to make available to the public important psychotropic fungi which previously had only been read about by most of our community. Terence and I had an instant “connection.” What I didn’t know when I first met him, aside from the lively conversation we had at the party that night, was that along with Timothy Leary, this was another Irishman who had kissed the Blarney Stone. Since that night, Terence has lectured around the globe, holding audiences mesmerized by his talks on a variety of unusual topics. Master Web Artist Dmitri Novus has also created a rich Terence McKenna space as part of his The Deoxyribonucleic Hyperdimension (http://www.deoxy.org). Another lecture I attended was about Terence’s theory that the magic mushroom was a much-used part of our tribal past. This view is expressed in his book Food of the Gods, McKenna believes that our past several thousand years have been a fall from our Dionysian, tribal, psychedelic past and that we are headed for an Archaic Revival, the subject of a series of essays and interviews in a book by the same name. McKenna is also a close friend with Chaos Theorist Ralph Abraham, a professor of mathematics at my alma mater, U.C. Santa Cruz, and has conducted wide-ranging discussion with him and English biologist Rupert Sheldrake that was published in another recent book, Trialogues. As you can see, Terence has indeed filled our ears and eyes with many words in the 15 years since we first met. Not content to rest on his laurels, he has published a number of recent articles about the link between the Internet and the psychedelic experience and is currently working on a new book about the future. At the same time a poet and a scholar. We are proud to dedicate this issue to one of the most significant spokesmen of a new generation of leaders of Island’s community of like-minded folk in search of a new culture. In 2005, a new edition of The Evolutionary Mind was published, consisting of transcribed selections from the trialogues between chaos mathematician Ralph Abraham, renegade biologist Rupert Sheldrake, and explorer of the “ontological foundations of shamanism and the ethnopharmacology of spiritual transformation” Terence McKenna, which took place at the Esalen Institute in Big Sur, California. David Jay Brown, whose own interviews with Terence will come up in future blog posts, reviewed the new volume for Shift: At the Frontiers of Consciousness, the (former) quarterly magazine of The Institute of Noetic Sciences (IONS). I received the other three issues of Psychedelic Monographs & Essays–I received and mentioned the first ordered issue last week only to note that there was not much to be found in its pages related to TM. Well, the same is largely true of the remaining volumes of PM&E, although there are a few mentions that I will note. In #2, there’s nothing. In #3, there is a citation for both The Invisible Landscape and the original audiobook of True Hallucinations (before a published book ever existed) as part of an article on Rupert Sheldrake and his ‘Hypothesis of Formative Causation’. The McKenna’s are cited among a group of observers who have noted “past life remembrance” with psychedelics. In #4 there are a few more citations: in an article on ‘Meditation and Resonance Effects’ by Philo Stone, the ‘Organismic Thought’ chapter of The Invisible Landscape is cited and in an article on ‘The Mushroom Entheogen’ Terence and Dennis are cited under their Oeric & Oss pseudonyms for their book, Psilocybin: Magic Mushroom Grower’s Guide. Terence also shows up in an advertisement for an event in honor of Albert Hofmann at which he would be a featured presenter to take place on October 2, 1988 at the Scottish Rite Temple in Los Angeles and is listed on the subsequent page as among the board members for the Albert Hofmann Foundation. Finally, there is an advertisement for Terence’s talks, via Kat Harrison’s Lux Natura catalog, which appears near the end of the volume located next to an advertisement for Botanical Dimensions. 2. Exposure magazine from October 1990 included a dual-article with pieces written by both Timothy Leary and Terence McKenna. This is a fairly rare and little-known (and quite large) item. I am only aware of one other copy currently available online going for about $60. 4. The April 1995 issue of Yoga Journal featured an interview with Ralph Abraham, which mentioned Terence in passing as a collaborator. I also spent a few hours in the Image Resource Center on campus scanning photos from Chip Simons’ early 1990s shoot at the house in Occidental. I will be able to offer these very high-quality photos as part of the forthcoming crowdfunding campaign and am excited to eventually show them. The following are other editions of Terence’s books that the TM Archives does not currently own hard copies of…if you would like to donate to help the acquisition process, you can use the “Donate” button at the top of the Terence McKenna Transcription Project website, or if you would like to send a copy of any the following books (or any foreign language translations of TM’s books) for us to add to the archive’s holdings, please send an email to terencemckennaarchives@gmail.com. If there is anything that you think I’m missing on either list, let me know. I thought I’d start another new feature here at the Terence McKenna Archival Blog. In addition to the ‘Weekly Haul‘ and other featured items that I select from the archives, I decided that one way to get through some of the archives is to do a more regular ‘Random Item’. I’ve given each item in the archive a number (well, most of them, anyway) and will use a random number generator to choose which from among them to include in the blog feature. Terence made three contributions to a publication called ReVISION: The Journal of Consciousness and Change in the mid-80s. During the time that his pieces appeared, the executive editors of the journal were Stanislav Grof, Ralph Metzner, and Huston Smith, each among the pioneers of American psychedelia. Terence’s appearances in ReVISION would have been an important outlet for his work to certain important segments of the counterculture at this formative stage in his career. In Vol. 10 No. 1 (Summer 1987), an essay called ‘Temporal Resonance’, written by our own TM, appeared next to other articles by Rupert Sheldrake and Ralph Abraham (his co-conspirators for a popular series of trialogues that took place as workshops at the Esalen institute, some of which were later edited and published as books), Ralph Metzner, and physicist Nick Herbert. In Vol. 10 No. 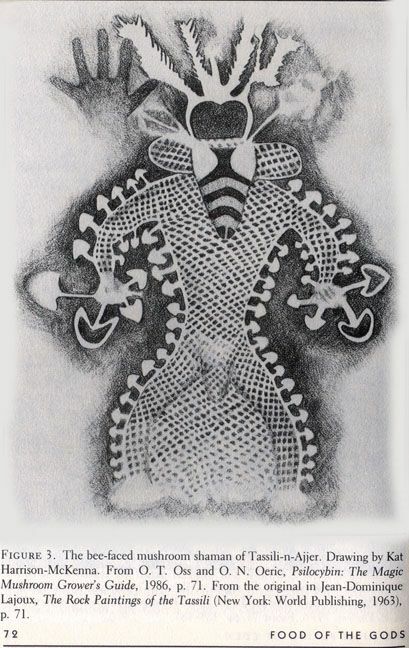 4 (Spring 1988), in an issue whose cover bears Kat Harrison’s now iconic drawing of the ‘bee-faced mushroom shaman’ from Tassili-n-Ajjer, another essay by our protagonist appeared with the title ‘Hallucinogenic Mushrooms and Evolution’ alongside other essays by Albert Hofmann, Robert Forte, and, again, Ralph Metzner. At the end of the issue, there is also an advertisement for the 1988 International Transpersonal Conference, whose theme for the year was ‘The Transpersonal Vision: Past, Present, and Future’, which lists “Terrence McKenna” [sic] as a speaker. Finally, in Vol. 11 No. 3, (Winter 1989), in a discussion (roughly) on the subject of UFOs, Terence talks with an unnamed interlocutor in an interviewed dubbed ‘A Conversation over Saucers’. And, following up on the previous advertisement, a new ad for the recordings from the 1988 International Transpersonal Conference appeared in this issue, including Terence’s talk called ‘Non-Ordinary States Through Vision Plants’. All three of these ReVISION pieces were eventually republished under the same names in Terence’s book The Archaic Revival (except the word ‘Hallucinogenic’ was removed from the title of the second piece to render: ‘Mushrooms and History’). Here, the previously unnamed interviewer was finally identified as Will Noffke, radio host and owner of the Shared Visions bookstore in San Francisco which had a history of hosting Terence for talks and book signings. (Note of interest: my own bound set of ReVision volumes came to me from the library of the Association for Research & Enlightenment, or A.R.E., in Virginia Beach, which was founded by Edgar Cayce to support his research and whose legacy is carried on there by his family. They were selling off some of the items from their library, so I purchased their set of bound ReVISION volumes). Thanks A.R.E. for selling me the volumes!